When a tree's wound penetrates through the bark and into the sapwood, the tree bleeds a resin. Myrrh gum, like frankincense, is such a resin. When people harvest myrrh, they wound the trees repeatedly to bleed them of the gum. Myrrh gum is waxy and coagulates quickly. After the harvest, the gum becomes hard and glossy. The gum is yellowish and may be either clear or opaque. It darkens deeply as it ages, and white streaks emerge. Commiphora myrrha is native to Somalia, Oman, Yemen, Eritrea, (Somali Region) of Ethiopia and parts of Saudi Arabia. 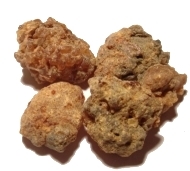 Meetiga, the trade-name of Arabian Myrrh, is more brittle and gummy than the Somali variety and does not have the latter's white markings. Fragrant "myrrh beads" are made from the crushed seeds of Detarium microcarpum, an unrelated West African tree. These beads are traditionally worn by married women in Mali as multiple strands around the hips. The name "myrrh" is also applied to the potherb Myrrhis odorata, otherwise known as "cicely" or "sweet cicely". Liquid myrrh, or stacte, written about by Pliny, was an ingredient of Jewish holy incense, and was formerly greatly valued but cannot now be identified in today's markets. 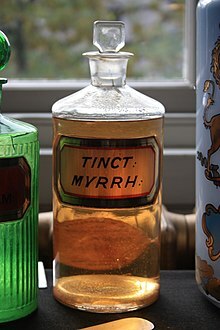 The word myrrh corresponds with a common Semitic root m-r-r meaning "bitter", as in Aramaic ܡܪܝܪܐ murr and Arabic مُرّ murr. Its name entered the English language from the Hebrew Bible, where it is called מור mor, and later as a Semitic loanword was used in the Greek myth of Myrrha, and later in the Septuagint; in the Ancient Greek language, the related word μῠ́ρον (múron) became a general term for perfume. Commiphora gileadensis (listed as "Balsamodendron ehrenbergianum"
In traditional Chinese medicine, myrrh is classified as bitter and spicy, with a neutral temperature. It is said to have special efficacy on the heart, liver, and spleen meridians as well as "blood-moving" powers to purge stagnant blood from the uterus. It is therefore recommended for rheumatic, arthritic, and circulatory problems, and for amenorrhea, dysmenorrhea, menopause, and uterine tumours. Myrrh's uses are similar to those of frankincense, with which it is often combined in decoctions, liniments, and incense. When used in concert, myrrh is "blood-moving" while frankincense moves the qi, making it more useful for arthritic conditions. The 5th dynasty ruler of Egypt King Sahure recorded the earliest attested expedition to the land of Punt, modern day Horn of Africa particularly Somalia which brought back large quantities of myrrh, frankincense, malachite and electrum. Other products that were also brought back included wild animals, particularly cheetahs, the secretary bird (Sagittarius serpentarius), giraffes and Hamadryas baboons (which was sacred to the Ancient Egyptians), ebony, ivory and animal skins. Sahure is shown celebrating the success of this venture in a relief from his mortuary temple which shows him tending a myrrh tree in the garden of his palace named "Sahure's splendor soars up to heaven". This relief is the only one in Egyptian art depicting a king gardening. Myrrh was used by the ancient Egyptians, along with natron, for the embalming of mummies. Myrrh is mentioned as a rare perfume in several places in the Hebrew Bible. In Genesis 37:25, the Ishmaelite traders to whom Jacob's sons sold their brother Joseph had "camels ... loaded with spices, balm, and myrrh," and Exodus 30:23-25 specifies that Moses was to use 500 shekels of liquid myrrh as a core ingredient of the sacred anointing oil. Now when every maid's turn was come to go in to king Ahasuerus, after that she had been twelve months, according to the manner of the women, (for so were the days of their purifications accomplished, to wit, six months with oil of myrrh, and six months with sweet odours, and with other things for the purifying of the women). Myrrh is mentioned in the New Testament as one of the three gifts (with gold and frankincense) that the magi "from the East" presented to the Christ Child (Matthew 2:11). Myrrh was also present at Jesus' death and burial. Jesus was offered wine and myrrh before the crucifixion (Mark 15:23). According to John's Gospel, Nicodemus and Joseph of Arimathea brought a 100-pound mixture of myrrh and aloes to wrap Jesus' body (John 19:39). The Gospel of Matthew relates that as Jesus went to the cross, he was given vinegar to drink mingled with gall: and when he had tasted thereof, he would not drink (Matthew 27:34); the Gospel of Mark describes the drink as wine mingled with myrrh (Mark 15:23). Myrrh is also used to prepare the sacramental chrism used by many churches of both Eastern and Western rites. In the Middle East, the Eastern Orthodox Church traditionally uses oil scented with myrrh (and other fragrances) to perform the sacrament of chrismation, which is commonly referred to as "receiving the Chrism". According to the Encyclopedia of Islamic Herbal Medicine, "The Messenger of Allah stated, 'Fumigate your houses with al-shih, murr, and sa'tar.'" The author claims that this use of the word "murr" refers specifically to Commiphora myrrha. Modern myrrh has long been commented on as coming from a different source to that held in high regard by the ancients, having been superior in some way. Pedanius Dioscorides described the myrrh of the first century AD as most likely to refer to a "species of mimosa", describing it "like the Egyptian thorn". He describes its appearance and leaf structure as "pinnate-winged". The ancient type of myrrh conjectured was noted for possessing a far more delightful odor than the modern. ^ Pliny the Elder with Bostock, John and Riley, Henry Thomas, trans. (1855) The Natural History of Pliny. London, England, UK: Henry G. Bohn. vol. 3, Book 12, Chapters 33–35, pp. 129–132. From Ch. 35, p. 130: "The [myrrh] tree spontaneously exudes, before the incision is made, a liquid which bears the name of stacte, and to which there is no myrrh that is superior." ^ "Species Information". www.worldagroforestrycentre.org. Archived from the original on 2011-09-30. Retrieved 2009-01-15. ^ Al Faraj, S (2005). "Antagonism of the anticoagulant effect of warfarin caused by the use of Commiphora molmol as a herbal medication: A case report". Annals of Tropical Medicine and Parasitology. 99 (2): 219–20. doi:10.1179/136485905X17434. PMID 15814041. ^ Michael Tierra. "The Emmenagogues"
^ Morrow, Joh A. "Encyclopedia of Islamic Herbal Medicine". Jefferson, N.C.: McFarland, 2011, p. 145. Massoud A, El Sisi S, Salama O, Massoud A (2001). "Preliminary study of therapeutic efficacy of a new fasciolicidal drug derived from Commiphora molmol (myrrh)". Am J Trop Med Hyg. 65 (2): 96–99. PMID 11508399. Wikimedia Commons has media related to Myrrh. Look up myrrh in Wiktionary, the free dictionary.